From my point of view I think the bomb was something immediately and close to the last events with Wanted: Bebop and Rocksteady (some months after that). He did say people would be talking about it for a long time, I wonder if that's also to do with the unanswered questions? Still, there is the story he's working on, whatever that turns out to be maybe it will answer some things. People here maybe. Not so sure it'll be seen as anything other than a bizarre ending by most people who know about the production order, anyone else will think the show ends on Bebop expressing his desire to dance. Yeah I think that was before Nick re-scheduled. The one with Fugitoid which runs parallel with the apocalypse, it was in a facebook or instagram thing that I think Vicky posted. Nothing more was said about it though. 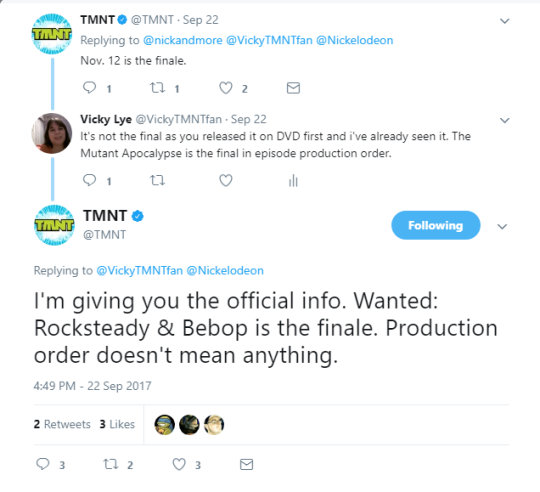 Before I watched the Mutant Apocalypse, I said to that TMNT Twitter account that the Mutant Apocalypse is series final not the crossover and it's in production order, but they said that the crossover arc is officially the series final. At that time I was thinking about arguing with them over it, saying that Ciro said it's the series final. But I thought I better not as I didn't want to get blocked, so I just left it. Last edited by Vicky82; 10-04-2017 at 11:36 AM. So basically the execs at Nick don't want Ciro's finale to be considered it. Oddly enough isn't it still the last episodes on the DVDs? I may have gotten you confused with Redworld, not sure which one of you posted it, it was the one with Ciro answering questions after the arc aired. I can't remember, I think it was me. Someone from Tumblr spoke to Ciro on Instagram and copied the answers onto Tumblr. I know Redworld spoke to that other person who worked on the show and they said that the Kavaxas arc is the true final and the other arcs were just side stories. WOW! Nick really hates this finale don't they? Why approve it then if you didn't like it. It makes me think they were asleep at the wheel. I've bought the Wanted DVD but haven't watched it yet. Been waiting on the full monster arc to air so they're all up in HD on Amazon before watching them together first. It is October, after all. I'd planned to watch the Apocalypse arc last as intended, but honestly I'm slightly afraid to even watch it at all now lol. People are pretty divided on it here and elsewhere, and overall it sounds like even those that accept it as the official ending to the series don't really like it much either - they just choose to willingly accept it as intended. I've read spoilers so I know pretty much what plays out, and admittedly it sounds pretty depressing to me. Definitely not what I wanted at the conclusion of 5 years emotional investment in this latest series. I can certainly understand many fans feeling the same way and even Nick trying to dismiss it as the official ending. I will undoubtedly watch it eventually regardless coming up at some point, but it's a shame I'm honestly dreading doing so now. It just sounds like such a damn downer after an overall great ride with this series. Whoever made the comment earlier on in this thread (or the official finale thread, I forget which) about using these series and many other comparable things as a cathartic escape at times is absolutely spot on. There's enough terrible, depressing crap going on in the world at all times - I don't need it completely hijacking and permeating every pore of the fantasy content I typically enjoy that allows me a form of joyous escape and distraction. And look... dark themes and 'bad happenings' are ok - they arguably enrich storytelling and create viable stakes that add drama and tension - just don't go full nihilism like a 14-year goth girl who hates mommy and daddy and everyone else except her Hot Topic boyfriend lol. I'm almost 40, so this overly heavy grimdark garbage infecting so much of entertainment these days is beyond played out IMO. I'm actually excited at the prospect of a new, lighter show that won't murder Splinter onscreen repeatedly lol. I'm actually excited at the prospect of a new, lighter show that won't murder Splinter onscreen repeatedly lol. As for your comments, and the other persons relating to some shows being an escape, yeah I can see that for a lot of people. Why approve it then if you didn't like it. It makes me think they were asleep at the wheel. I've wondered the same, surely Nick knew what the story was. Not sure it's so much that they hated it or just that as a children's television network they are just being more child friendly with the end, you know letting the last they see of them be the familiar faces they've known them for 5 years. Last edited by newfan; 10-04-2017 at 12:47 PM. I wasn't bothered if the Mutant Apocalypse ended happy or sad, I just wanted to see a solid story with all 4 turtles in it from start to finish and with there friends appearing or even mentioned. "Production order doesn't mean anything"
and that was probably done out of spite, too...because cancelling the show put the producers in a hard spot, and they had to wrap things up fast, so that was the easiest way to do it. Go back to your He-man forum where you belong. The show was already properly wrapped up prior to the last 3-parter. "The production order doesn't mean anything"
The press release made it sound like When Worlds Collide will be the last episode on disc 2 lol. Last edited by ToTheNines; 10-04-2017 at 03:10 PM. Who says they didn't in the 50 years prior to Mutant Apocalypse? Better yet, who says they didn't become heroes AFTER the finale? They find the Oasis, they create a small comunity, mutants all over drawn together and create something of an Utopia, an Eden, wouldn't that make them Legendary Heroes? The Heroes that saved every living thing left on the planet? Renet is human-like sure, but there might be more mutants like April out there, that just look human, or Renet might just be from a place outside of Time (like she is in every other version), or maybe she's not even from Earth, human-like Aliens might find Earth in the future and move there, long after the Turtles passed away, but still found stories about their deeds, after all Renet never met the Turtles, implies they passed way before she was even born. Just because it seems like it's nothing like what Renet told them it doesn't mean it still contradicts everything, we where just never told the full story, we just know of how it ended, with the Turtles being considered Legendary Heroes who saved Earth, doesn't have to be the Earth they knew at the time. Honestly, this just makes everything more confusing. I think people are putting too much care into the production order. It doesn't really matter, if you watch Mutant Apocalypse its obvious its meant to be the ending. They aired it out of order. That's it. Yeah, Renet lives outside time and space. She isn't a part of their world as they know it. She's on the outside looking in.